Jenny Cassier strolled out to her backyard henhouse, excited to gather some freshly laid chicken eggs. Much to her dismay, she instead found her hens in the nest box, eating their own eggs. “What do I do to stop my chickens from eating their eggs?” she wrote to us recently. The problem of egg layers eating their own eggs — a form of cannibalism — isn’t uncommon, nor is it impossible to stop. However, the longer you wait to correct this issue, the harder it will be to cure your egg-eating hens from this terrible habit. Why Do Hens Eat Their Own Eggs? Hard, solid floors. Research shows that egg layers who are raised in cages are generally less apt to eat their own eggs. Overcrowding. If you don’t give your layer hens enough room in your backyard coop, the stress may provoke them into habits such as egg-eating. Poor nesting space. If the nests you provide your hens are too small, or if there aren’t enough nests for your backyard chickens to share, the stress may provoke egg-eating and other poor habits. Nutritional deficiencies. Farming research suggests that nutritional imbalances, specifically as it relates to vitamin D and calcium, may provoke egg-eating in layer hens. Several general husbandry features can prevent your hens from eating their own eggs in the first place. Prevention is always easier than trying to cure your hens of the habit later! Start by providing a minimum of one nest for every four layer hens. Each nest should also provide the laying hen with adequate space. Kansas State University recommends a nest size of 12 inches by 12 inches, and advises placing them 24 inches off the ground in an area that’s dark and quiet. Also, collect eggs as often as possible. This limits the chances of the eggs breaking, which encourages the hens to eat them. The University of New Hampshire suggests gathering eggs at least twice a day and notes that hens typically lay during the morning hours. Finally, feed your hens a well-balanced, commercially prepared chicken feed product that’s been labeled for use with egg-laying hens. If your hens are already eating their own eggs, you can manage and resolve this cannibalism problem with several changes to your hens’ care and feeding regimen. Give your egg layers a calcium supplement, like a side hopper of limestone or oyster shells. The extra calcium in their diet improves egg shell strength, which Kansas State University reports will help lower your egg-eating problems. Fill a dish with milk and let your hens drink it. Do this for several days and you’ll see a decreased problem with egg eating, according to the University of Florida Extension. Remove the offending hen. Typically, egg-eating starts with one or two hens and other hens start to pick up on the bad habit. Observe your flock of backyard chickens carefully as soon as you notice a problem with hens eating their own eggs. Once you spot the hen (or hens) with pieces of eggshell or egg yolk on their beak, remove them from the flock immediately. Trick your hens. The University of Florida suggests beating an egg into a creamy liquid, adding 2 tsps. of ground black pepper, and pouring it onto the floor of your chicken coop. The university reports that the hens will peck at it and find the taste disagreeable, thus curing them of the egg-eating habit. This is horrible, thing I have tried all the above suggestions. they have a great pen dirt. i have 8 hens to 20x 40 feet pen. big hen house, great diet, it doen’t matter how much stuff i give them for pecking they go after the eggs. all of them are doing it, even the 2 old hens that don’t lay in the past 6 years. I go how to get the eggs every 30 min, I have to beat them to the eggs as soon as a hen lay the egg, get up the others watch, and wait and get in the nest and destroy the eggs. I have to retrieve the eggs while they are still on the nest, other wise the hens will get in the nest and destroy the eggs. I have even pushed the aggressive hen out of the nest, when I catch them eating the eggs, it doesn’t even discourage them. If I’m not home they will eat all 8 to 10 eggs. I have never had this serious issue I’m quitting they r to expensive not to have any eggs. I have devil chickens i also raised them from chicks also. I have heard that if you put golf balls in with them they will peck at those and eventually get frustrated and stop pecking eggs. I havent had to try yet but just witnessed a hen eating an egg for the first time this morning. I hope it was an isolated incident. Once they start I don’t know how you would stop them. Did you feed you chicks grit and oyster shells? I have a large pen also few backyard chicks just for us. But I supplied them with grit and oyster shells even though they have dirt. It is something my grandmother always did. She said it would make better eggs. Oyster shell is expensive. But it lasts a long time. You use just a little. I would recommend an incubator. And start again. Time for you to have some fresh chicken stew. Or chicken and dumplings. De-beak the hens with a sharp knife heated in red hot charcoal. The heating disinfects the knife and makes an easy and clean cut. Take care not to cut the hen’s tongue. the blunt beak does not readily break the egg shell. Put some red pepper in a broken egg for about a week. They’ll find out they don’t like it very much. Prevention is so much easier than a cure. will a chicken snake eat part of the egg and after the chickens have been scared because something has been getting the rest of them how long does it take to lay again. We had the same problem with our girls pecking a hole in almost every egg and eating some of them too. We read that golf balls cured this so we placed golf balls in their nests and the pecking went away almost immediately. Apparently they think the golf ball is an egg and when they are unsuccessful, it fools them into stopping the behavior. Occasionally we have egg eating problems but this is now a soft egg issue and not a aggressive egg pecking issue. My bantam x hens have never done this. They are totally free range but have two spacious houses equipped with hay-strewn floors and comfy nesting boxes. I recently bought some rescue Lohman Lites that had been de-feathered by their peers. One of them has acquired a taste for her eggs after accidentally putting her foot through one. It’s difficult to find which one is the culprit but I try to visit the house 4 x day to extricate what’s been laid. You can imagine the ire of the others still in action. Perhaps they need something like our moms did if we sucked our thumbs – mustard on the thumb. Any suggestions? I believe lots of calcium could be the answer – so they can’t break into the shell easily. How do you get them to eat more grit? I found one more thing that helps a lot is to make sure the nests are dark. Just stapling some tarp or material over the nest opening so the chickens can go in but just can’t hardly see at all. If they can’t see the eggs they cant eat them. Putting some fake egss in the nests helps too (golf balls work). I stapled tarp and then sliced on the bottom half vierically so they can slither through. how do I get one of these?? I’ve just read your old post about your laying boxes that let the eggs roll away & am I terested in purchasing some. Please send me info on this. I am very disappointed in my brown Sussex chickens. I have 1 rooster and two hens. They are just 5 months old and I discovered one chicken laid an egg. I was able to collect in unharmed. So for a week I have been expecting more eggs but never got any. Today I found the remains outside of the next boy which was only the white. So it looks like two hens could be laying and eggs are getting eaten. Yes, this was an expensive project and I was looking forward to letting hens hatch little ones. Oh boy! One of the easiest way to prevent egg eating in your hens is keep an oval shape (egg size) stone painted with white colour. The hens will try to break the stone. this method is very effective. Easy! Just add anything really hot into a broken egg, mix in and place back in the nest for them to eat. Tabasco sauce is good, mustard powder, any sort of chilli, the hotter the better. You may have to do this several times but it will cure them. Since he got a rooster our hen stopped laying. An the young one who would be laying by now having started. We got rid of the rooster and still nothin.. would you see remnants of eggs? Not sure their eating them or just not laying. Be still my heart I ADORE both your coops!! My husband just fieishnd drawing plans for our first coop and we are so excited to get started. We’re only going to have 5 chickens, 2 of which hopefully being silkies. I wanted to ask if your silkies use the nesting boxes and roosts that the other chickens use? I know siklies are more on the petite side and wasn’t sure if we should do some lower access laying boxes and roosts thoughts?? Thanks!! I tried mustard in the eggs, my chickens ate it all! Twice. Guess they like mustard. And hot stuff? I give them jalepenos out of my garden! I hear they don’t have sense hot stuff. Right now I am trying soap and food coloring in a blown out egg. I’m also going to add in Golf Balls. 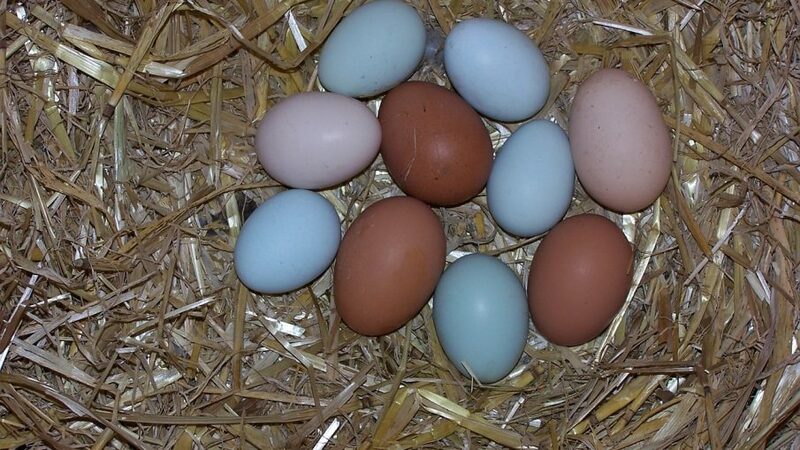 I have 9 ‘girls’ 2 Light Sussex, 2 Leghorns, 3 Bluebells, 1 Speckled Maran (Cuckoo) 1 Rhode IslandX. They are all in their 3rd year (I lost 2 last year, one on the road and one died of fright from our puppy boxer!!) They had been laying prolifically until this spring/summer. Now I’m lucky if I get 4 eggs a day. The Leghorns eggs have become extremely papery and this has led to most of them becoming crushed by the others laying on top of them. Sometimes they lay up on the roost shelf. Today i found two eggs, one brown both crushed and empty in the run. I am assuming that they may be eating the eggs. Perhaps curiosity led them to taste one of the accidental broken ones in the first instance. However, they have 4 large nesting boxes, their run is 25 metres sq. and they free range all day in a quarter of an acre field!! We feed them on good quality pellets, fresh fruit and veg, and scratch in the evening to call them in. Two trays of oyster shell and grit are permanently available. Most people also tell me my girls are very healthy looking. So what on earth are we doing wrong!? Would a golf ball really fix this? Advise needed by you experts please!